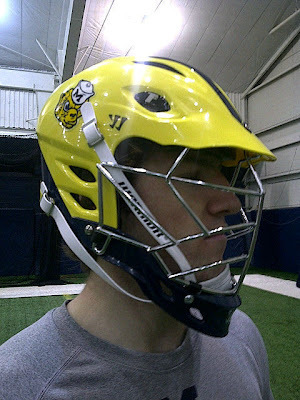 This is just one more reason for me to love Michigan Lacrosse a little bit more. Michigan Men's Lacrosse has released pictures of their new lacrosse helmets, & I'm obviously a really big fan. Leave it to Michigan to whip out the vintage wolverine logo (the little furry creature you're probably wondering about on the side of the helmet). 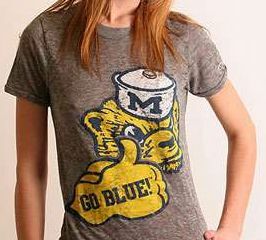 That logo adorns itself on many a Chip & Pepper shirt at U of M.
I love the winged helmet as much as the next girl (obviously, I own "winged helmet" stilettos), but I'd be lying if I said I wouldn't love to see them rock these in a game or two. 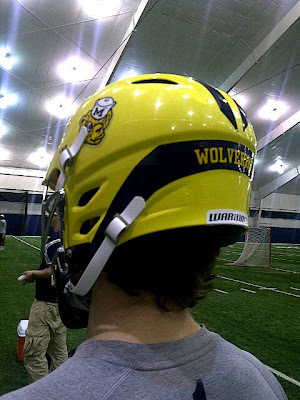 Seeing these make me wish so badly that Michigan Lacrosse was playing on the national varsity level. But until we are, we have some really sick helmets. GO BLUE. I LOVE throwback sports gear! Great t-shirt, I also love lacrosse accessories.